Simon sent us this good idea that himself has made. 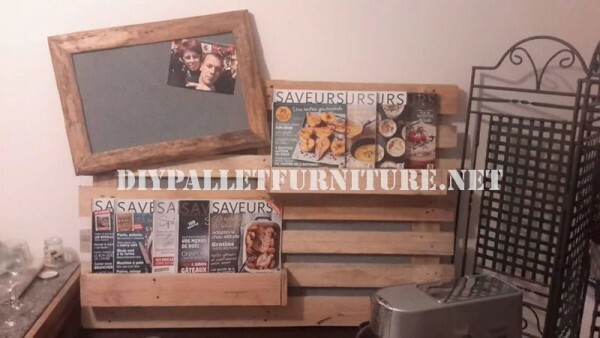 Using a single pallet and some wooden planks from another pallet, he has created this unit with a double functionality, such as a magazine rack and as a mural where to place photos. We love this proposal, as it’s not complex and the result is very good. You don’t need to paint the furniture because the wood finish is more than good for its function. A whole pallet builds the main structure, we should not change it, we can even do as Simon has done, he has not even fixed it to the wall, he has just supported it over the wall giving a more casual touch to the room. Then he has created the shelves that will work as magazine racks, just had to make a few small drawers with some planks from another pallet and fix them to the main pallet, to do all of this it will be enough with a hammer and some nails. Finally he has added a mural where to place the pictures in one of the corners, a simple small blackboard can make it, you can buy it in a decor shop or some school supplies store. The blackboard will be very helpful, you can put some pictures there and also write some message reminders for the family, such as the shopping list. Thank you very much for your input Simon 🙂 and to all of you if you want to send your furniture send your pictures to our Facebook page. Do you want to look for more pallet furniture for the living room? Do you want to look for more pallet shelves?